This rugged terrain first made history in the 1800s, when the gentleman bandit Charles Earl Bowles, known as Black Bart, robbed the daily stagecoach that traveled over the hill from St. Helena to Monticello. Early German settlers discovered the well-drained soils and perfect growing conditions, and their grapes brought some of the highest prices in the Napa Valley. Soon a nearby luxury mineral spa was attracting visitors from San Francisco and beyond. But by the early 1900s the increased deer population devastated the vineyards and by Prohibition viticulture was abandoned on these hills. In 1991, Dr. Jan Krupp saw an ad in the San Francisco Chronicle selling a Napa Valley property with good water and soils. His interest grew when, on his first site visit, he noticed a few old vines, perhaps 100 years old. With the help of a few good friends, he began developing the property in 1995, defying what many local experts had claimed was an impossible task. It took seven years to clear more than a billion pounds of volcanic rock. Then there was the issue of water, which hadn’t yet been found on the arid land. Jan hired a world-renowned geologist, who identified five potential locations. Drill to 300 feet, he advised, and when no water was found he recommended against purchasing the property. Instead of quitting, Jan hired a “water witch” who walked the property with her apparatus of two copper rods, stopping abruptly at one spot. Drill here, she said. At 400 feet, an underwater stream was found, as well as water at the five places identified by the geologist, but at the witch’s recommended depth. Now, with nearly 600 acres planted to vine, the Cabernet-focused Stagecoach is the largest contiguous vineyard in the Napa Valley. The 1,100+ acres of rocky, volcanic terroir extends from the southern edge of Pritchard Hill overlooking Oakville to the westernmost regions of the Atlas Peak appellation. More than 90 wineries craft premium wines from the fruit harvested on this challenging, dramatic terrain. Growing numbers of Napa’s best vintners are seeking the character and complexity found in our mountain grapes. More than 30 winemakers are using the Stagecoach name on their labels; more than 25 others are making vineyard-designated wines with our fruit. 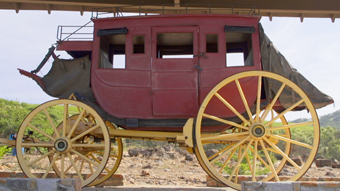 Beyond its stature as a premium vineyard, there is Stagecoach’s rugged beauty. Rare holly-leaf ceonothus plants and an expansive skyline are filled with birds of prey and countless reptiles and mammals. Among the sprawling acres of thriving vines and volcanic chaparral slopes are the gnarly remnants of an old vineyard created by the area’s first settlers. And the storied Water Witch’s Well lies near the vineyard entrance to Stagecoach, evidence of the powerful union of luck and perseverance that made this place possible. The spirit of Black Bart – who intimately knew and rode this verdant backcountry – is clearly still at home.